Serving up various dishes from around the world, Eastern Express will satisfy the tastes of any hungry seadog - Halal cuisine awaits! 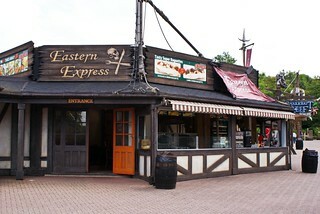 Eastern Express offers something a little different than other eateries at the Resort. This establishment offers Asian cuisine to tickle the taste buds, with everything from kebabs to curries. All meat dishes are Halal, and there are vegetarian options available, too. You may choose to order and eat inside the restaurant, or grab a quick bite from the outdoor windows selling jacket potatoes, fries and pitta wraps.